Naughty has been up to mischief since his last adventure. Cuddles has invited his friends to the land of paradise for some relaxation and fun. Naughty is outraged for not being invited and decides to hunt down Cuddles and his guests. 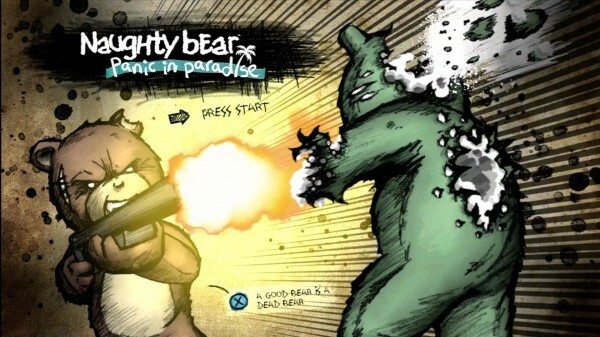 Naught Bear: Panic in Paradise is a parody of stealth based games. 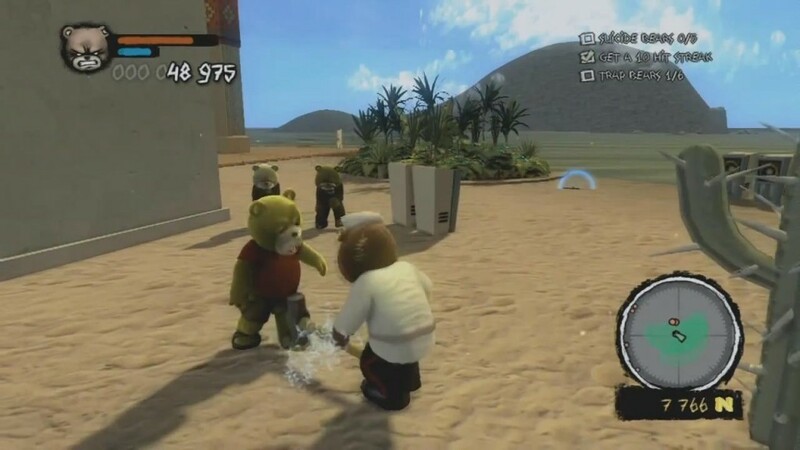 As Naughty, your mission is to sneak around the island of Paradise and execute the popular bears on vacation. As you sneak around the island, you can use the environment to your advantage. Small patches of underbrush can be used to hide as you select your victims. Bears will unwittingly walk through the island unaware of your prescience as long as you stay hidden. To walk freely among the other bears, you must steal another bear’s outfit without being seen. To steal an outfit, you must sneak up and grab a bear of your choice, walk into a wooded area, and press the L2 button. The bear will explode into stuffing and his outfit will then appear on Naughty. The outfit also unlocks and becomes available for purchase later. Once your identity is concealed, you can explore the island freely without being detected. The island of Paradise is massive; it’s divided into 40 different zones that contain many secrets. You can destroy most of the environment (i.e. crates, speakers, etc.) to collect coins (currency) to upgrade Naughty’s outfits and weapons. You can purchase any stolen outfit from the Shop after completing a zone. Certain items like hockey masks will unlock without having to steal them, but they don’t conceal Naughty’s identity and in some ways it defeats the purpose of purchasing them. Weapons will gain experience as you use them on your victims. Once a weapon gains enough XP, it can longer be leveled. The weapon selection is almost limitless and includes bats, rakes, swords, boxing gloves, stun rods, and brass knuckles among others. The game hasn’t changed much since the original Naught Bear. Gameplay is consistent with the original game and the floaty controls that garnered so many complaints before have been refined. Unfortunately, weapons still seem to suffer from that ‘floaty’ feeling. So swinging a bat during combat has the same impact as using a rack. It’s a shame this issue wasn’t addressed. Your objectives are far more diverse, and while they include assassinating lead party bears and their guests, you must also retrieve party invitations, collect a certain number of coins, and scare bears into committing suicide. Additionally, you can use certain objects in the environment like cactus and statues to impale your victims. Despite the lack of gore, some of the death sequences can be downright brutal. 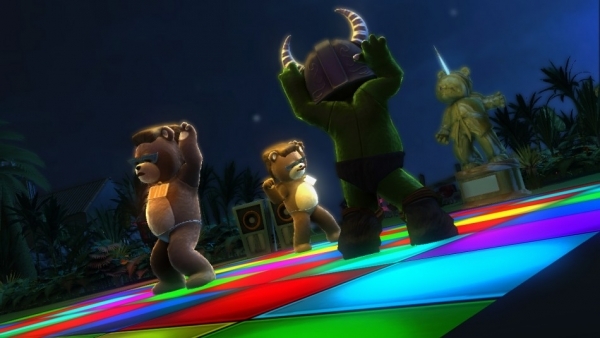 Naughty Bear: Panic in Paradise is not a disappointment like the original game. Bears will run to pay phones to call for help when you chase after them. You can sabotage these pay phones and other objects to hinder your victim’s escape. Some lead party bears will try to make a fast escape in cars or speed boats, but the ability to perform an ‘Object Kill’ produces hilarious results as you smash your target into oblivion. Naughty Bear: Panic in Paradise is a cute game with some appeal. It offers enough content to keep gamers busy while they mutilate their fellow teddy bear kin. Despite the issues that plagued the original game, Panic in Paradise can be a fun game to play if you can look past some of its reoccurring issues. If you haven’t already, you should give Naughty Bear: Panic in Paradise a chance — you might be pleasantly surprised. The graphics haven't improved much since the original game. Nothing beats screaming 'Booo!' at a terrified victim. It's fun beating the stuffing out of teddy bears. The controls could still use some work. Otherwise, Panic in Paradise is better than the original.